The alarm goes off on my phone at 7 a.m. and I probably snooze it. I need but usually fail to get nine hours of sleep, to my daily disadvantage. The four people in our household are evenly divided between morning people and emphatically non-morning people. I am in the second group, with my younger son, so once I’ve crawled up through the layers of grogginess and gotten myself out of bed, my job is to go jolly the still-unconscious younger boy out of his own stupor, while the bright-eyed people handle breakfast. Once the younger boy is responsive, I go put in my contact lenses, and then brush my teeth with Crest regular toothpaste. Years and years ago I learned that the active ingredient in tartar-control toothpaste secretly jacks up some people’s mouths, and that I am one of those people. So I use the old-fashioned ordinary toothpaste. Sometimes I have to crouch down to find it on the bottom shelf in the store below all the innovative and multifunctional toothpastes. When I was in college, a quarter-century ago, I was fastidious about not going outside until I had showered and dressed for the day. Because I was not similarly scrupulous about going to bed before 2 a.m., and because I had extremely long hair that had to be shampooed and untangled with conditioner, I missed almost every breakfast and more than a few lectures. Now I throw on some previously worn jeans, a flannel shirt, and a thick hoodie so I can take one or the other of the kids to one or the other of their schools, and I hope that makes enough layers for nobody to smell me in the crowded elevator. Other than that, and the lack of detangling, my routine has scarcely changed. Before or after delivering a child to school, depending on how many times I hit the snooze on my phone to begin with, I put on my one pair of workout shorts, clear away whatever Legos might be covering half of the living room rug, lay down a towel, and do my modest but annoying regimen of daily lower-back exercises. The aging process comes for all of us, one way or another. Then it’s shower time. I wash my hair with basic drugstore shampoo—Suave, usually, in whichever of the coconut or “ocean breeze” scents I was able to find. Lather, rinse, repeat, maybe repeat again. Every day, all my life. Alternative, minimalist theories of shampooing make no sense to me. Hair is a part of the body, the body gets dirty, you wash it. I like the coconut smell but other smells are fine too. Between shampooings, I wash my face and body with Ivory bar soap and a cotton washcloth. I buy the washcloths in bulk and mark one corner with a Sharpie so I can tell them apart from the cleaning rags in the laundry. The chisel tip is versatile. 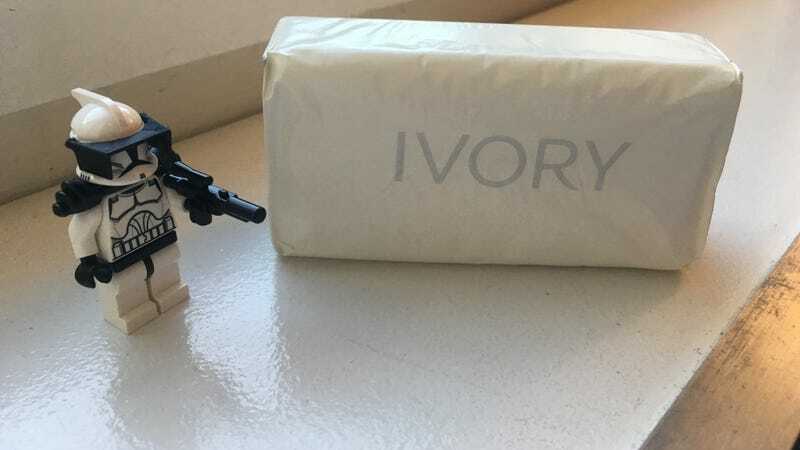 Ivory is perfect, the best product in the world. Again, the point of washing is to get clean. I don’t want my soap to add some scent, I don’t want it to leave a sticky residue of chemical agents to kill my skin biome, I just want whatever had accumulated on me gone. Someday the market segment for soap that is only soap will shrink to zero and I’ll be trapped in the itchy, overscented world of the fake-clean. When I was a greasy, zitty teen, my dermatologist told me to use Dove soap on my face and I did, dutifully, wondering all the while why my face still felt greasy afterward. Eventually I became aware that this was because Dove is not really soap, so it doesn’t seize the oil and carry it away. So I switched to real soap and never looked back. Most days I do not shave, because it is physically and conceptually irritating, and because I’m blond enough and lazy enough to believe I can get away with it. Maybe once a week, when my stubble threatens to look like something intentional rather than an oversight, I shave my face in the shower, by touch, with Edge shaving gel and a Gillette Mach3 razor. I got a Mach3 when Gillette sent one to the newspaper office I worked in 1998, promoting the product launch. I thought a three-blade razor was dumb but I tried it and it was way better than the two-blade Atra I’d been using. Maybe the subsequent ones with even more blades are even better, but I’ve never tried. The conditioner to the left is not mine. I augment the soap and washcloth with a little extra shampoo as a sort of body wash for the ears, eyebrows, and other crevices and/or hairy parts. Then I rinse off. I do not use conditioner, because my hair is too short to need untangling. I wrap my hair in a towel, a habit left over from my long-haired days. After a while, I unwrap it. If it looks a little weird, I run my fingers through it. It’s been more than a decade since the last time I used a comb to prepare for the day. My attitude toward my hair is basically the same as an extremely wealthy old-money person’s attitude toward their shabby clothes. I used to just let it grow out until I got annoyed by it, which usually happened when I was traveling, so I would get it cut by whoever was handy in whatever city. This worked fine until I tried it on the outskirts of Beijing with a stylist whose first language was Korean and whose solution to any points of confusion was thinning shears. When I got back to New York, the writer-actress-model who worked as the office receptionist cooed that my haircut made me look like a German lesbian; it was meant as a compliment (she herself was German), but I ducked out of the office and got the most expensive, and of necessity the most close-cropped, haircut of my adult life. I’ve gone to the same barber ever since, spacing the visits out at intervals that cause him grief and frustration. I still forget from day to day whether my hair is at the longer or the shorter end of things. But when I do go for a haircut, the barber’s appointment-booking software allows him to tell me that it’s been nine months since I last showed up, and so he does tell me. But he takes professional pride in his craft. Although it isn’t bragging about it like Speed Stick, Olay changed its look too; it’s so stripped-down now I was briefly afraid it was counterfeit. Last thing before heading out the door, I apply Olay Complete All-Day Moisturizer—the unscented sensitive-skin kind—to my face to serve as SPF 15 sunscreen. In the winter I sometimes skip this step, or may just smear a little on my nose and cheeks, but in the sunny months I use it without fail. I feel like I’m forever reading things about how it’s essential to protect yourself with a more serious sunscreen than a mere lotion, but I always burn without protection and I never burn with the Olay. From then through the end of the day, the only products I use are the various liquid soaps in the office restrooms or kitchen, to wash my hands as necessary. The hand soap in the office kitchen has a relentlessly clinging scent, so when I can, I nab a drop of Palmolive dish soap instead. At home, after dinner, I supervise the children while they take their showers. Not having attained adolescent grease and filth levels, they still shampoo every other day—Johnson’s Baby Shampoo for the six-year-old and now Suave for the ten-year-old. Through inertia they still have a bottle of Johnson’s Bedtime Baby Bath (with Naturalcalm® soothing aroma essences) as body wash, though the older one is using bar soap too. I think his is Lever. When my own bedtime comes, I floss with Oral-B Glide Pro Health Original Floss, then brush my teeth with Crest again. I wash my face with the washcloth and my own special face bar—i.e., a bar of Ivory that has worn down too small to keep using in the shower. Last of all, if it’s winter and my fingers are in danger of chapping, I put on some Jack Black Industrial Strength Hand Healer, provided the kids haven’t carried it off and left it somewhere. If I can’t find it and my fingers are threatening to split open, I dig out the Aveeno Baby moisturizing cream and use that instead. I try to remember to set my alarm first, so I don’t smear up my phone with the lotion.